In addition to its kind and friendly people, heartbreakingly beautiful landscapes and lively pub culture I became obsessed with three things while in Ireland. 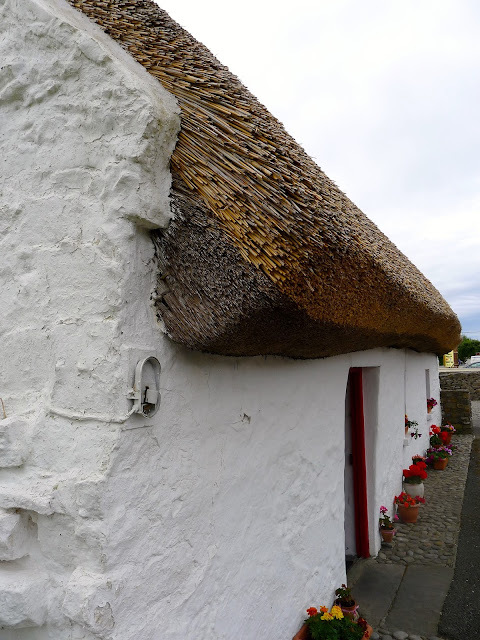 Peat bogs, thatched roof cottages and drystone walls. I saw all three of these things during our daily trips, then I googled them furiously later in the evening to learn as much as I could about them. 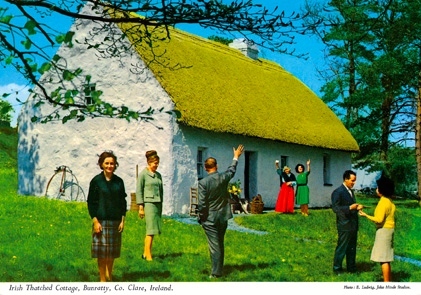 This vintage postcard is from years ago, but thatched roof cottages look exactly the same today. I love it that people still live in these stone cottages with thatched roofs. Form and function at its finest. 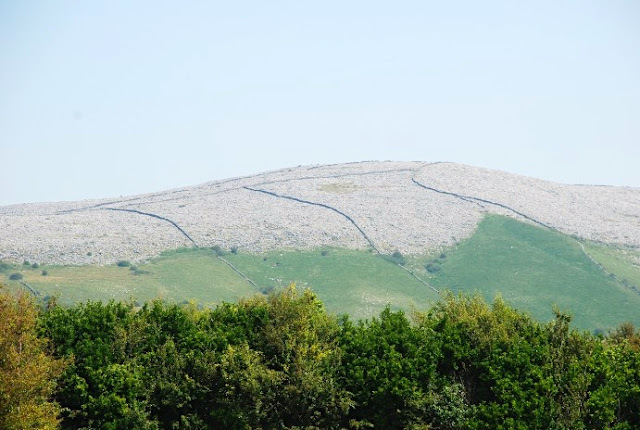 One expert estimates that there are 400,000 kilometres of drystone walls in Ireland. And I swear 399,000 of them are on the west coast of the country. I have never seen so many rock walls in my life! And not just rocks in walls. Rocks in fields. Lots and lots of rocks in fields. 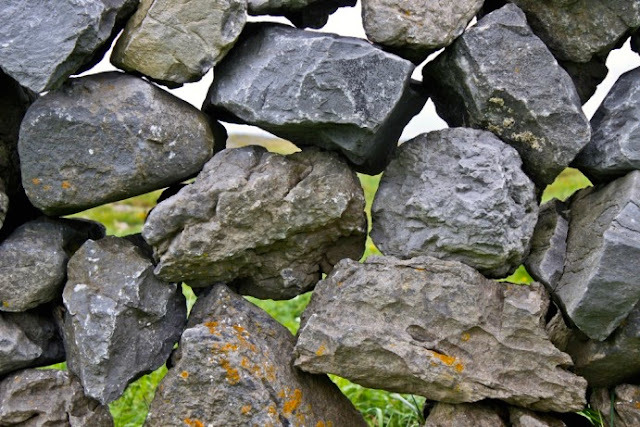 The tradition of building drystone walls is very ancient. The first stone walls were built in Ireland almost 6,000 years ago. They are the oldest drystone walls in the world! Drystone walls on Inisheer Island. I asked one of the locals on Inisheer, "Why so many walls?" She replied, "Well, the farmers had to put the rocks somewhere when they cleared their fields!" I learned the walls also help to prevent soil erosion. Building walls with no mortar allows the wind to blow right through them. Checking out the stiles on Inisheer. One thing I couldn't figure out were the miles and miles of stone walls that ran up hills seemingly to nowhere. And why would they be needed way up there? What was being walled in? Or out? I later learned that these are called 'Famine Walls'. "People often comment on long stone walls which run from the bottom to the stony top of a mountain and appear to divide nothing from nothing. They are known as 'famine walls' and were created by men employed on Work Schemes - usually run by church groups or by landlords - whose main purpose was to create employment for and provide income to the impoverished, often starving, local communities at the time of the potato famine. The walls do indeed divide nothing much from nothing much. Their purpose, aside from income provision, was to clear the land of stones, the wall just nothing more than a place to put them. In fact, clearing these mountains of stone would be impossible so it was a thankless task." 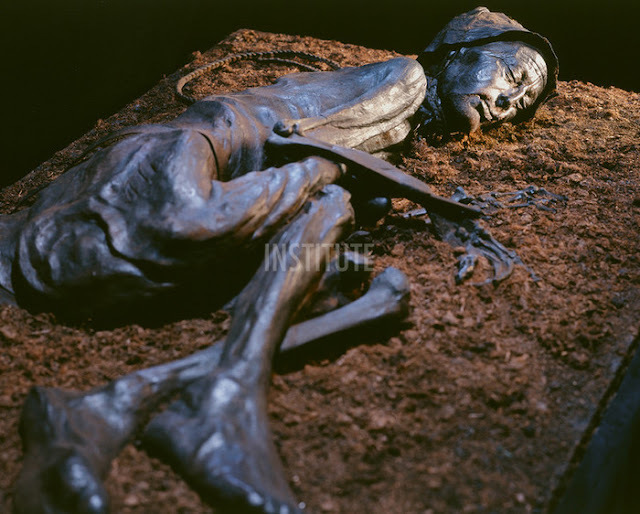 I was really surprised to learn that peat is still used today as a heat source. I thought it was only used in the 'olden days'. Nope! We drove past many peat bogs and saw how peat was harvested. Sods of peat drying out after being cut from the bog. Peat fires give off an incredible amount of heat. And I am in LOVE with the smell of its smoke. There is nothing, and I mean nothing, as delightful as sitting next to peat fire in a pub with a pint in your hand after a cold wet day of travelling. While I was having a romance with peat bogs, I remembered reading about 'bog bodies'. 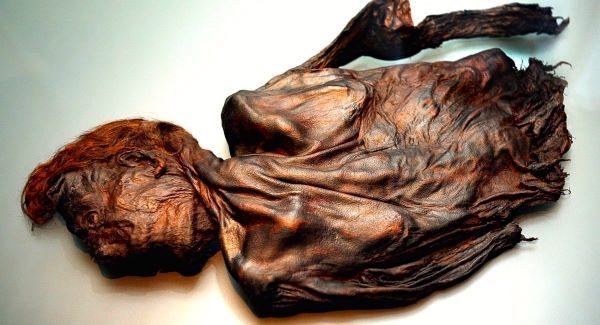 People who had died and were thrown into peat bogs thousands of years ago and whose bodies were incredibly preserved and intact when discovered recently. So off to Google I went again. I love the smell of peat smoke so much I bought some peat incense to burn when I get home. Peat, cottages and walls. I will miss them all.